I have been up since too early working so that I can take the 9 AM shuttle to Center City (a couple of miles away). Why????? I AM GOING TO SOCIAL SECURITY TO CHANGE MY NAME!!!! -copy of our marriage license, which I didn’t know we had to request, but I learned and I did. -the latest copy of Health Magazine, to keep me entertained while I wait. Somehow I feel like changing my name will make our marriage real, even though I’ve been in Philly for almost a month and have been living with my love for that same amount of time. All photos are by Marina & YI Sun of LifeFusion Photography. I love Marina & Yi- they did a great job! We have only seen about 40 pictures so far but we love what we’ve seen!!!! 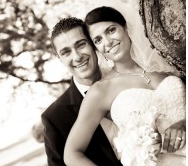 If you are engaged and looking for a great photographer(s)- you don’t need to look anymore! They were pricier than others but completely and truly worth it. More wedding photos are here and here. Changing my name comes right in time with the change of summer and fall. To celebrate the end of summer, I had my last bowl of ice cream last night: Edy’s Slow Churned Chemical Goo Vanilla + chocolate chips + chopped walnuts + RED GRAPES! Grapes and ice cream are actually amazing together. Try it! I am happy to have no ice cream left though, really. It is hard to eat one little bowl and be done with it, especially when you have delicious fruits in it! Off to become Mrs. PhillyBoy to the government! I hope it isn’t anticlimactic! first of all, your wedding pics are so much better than mine. i hate mine!!! grrr. I love the wedding pics! Fun fact: my sister’s name is Sabrina. I think it’s such a fun, pretty name. I have always been totes jealous of it. Good luck with the name change! Congratulations! What an exciting day! I hope you’re in and out of there quick. So exciting!! Good luck with the change – mine took quite a while to get everything done. Don’t forget to change your name on your airline miles – that’s one that is easy to forget! Your wedding photos are seriously gorgeous. Very exciting! I hope your wait isn’t very long! I think I was almost as excited the day I changed my name as I was on our wedding day! It made it all feel really official to me! Your wedding pictures are fabulous! I love the pic of you on the luggage cart, it’s adorable! Love your wedding pictures. The photographer is an amazing job! I was excited about changing my name too! It definitely makes if feel “official”! I told my hubby that if I ever start a business I am going to somehow incorporate my maiden name into the company name… I also wouldn’t mind if our future son used it as a middle name. Maybe that is going to far? I need to do that too – I have to request our wedding certificate first? Yes – a celebration is in order! That must be such a wonderful feeling–congratulations on making your new last name official! 🙂 Again I love you photos!